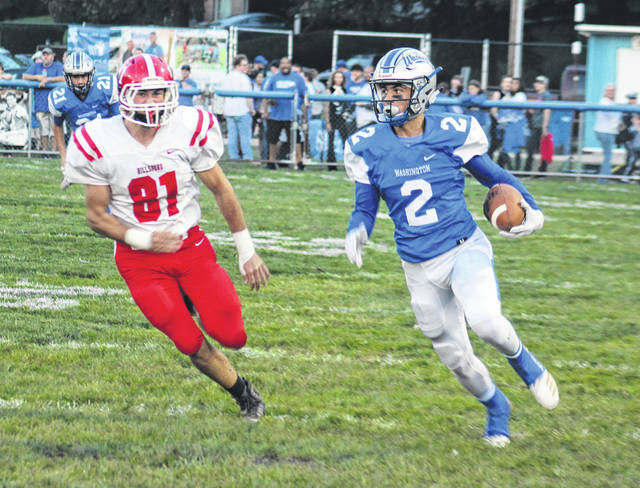 Dillon Steward (2) carries the ball for the Washington Blue Lions during a Frontier Athletic Conference game against Hillsboro at Gardner Park Friday, Oct. 5, 2018. Pictured for the Indians is Luke Middleton. The Washington Blue Lions were back at Gardner Park for Week 7 of the high school football season, Homecoming 2018 against the Hillsboro Indians Friday night. On a warm, humid evening, the Indians could scarcely be stopped in a 71-50 victory. Hillsboro improves to 6-1 overall, 1-1 in the FAC. Washington dips to 4-3 overall, 0-2 in the conference. Hillsboro led 52-28 at the half. The teams exchanged touchdowns in the first quarter, with Washington scoring first. Both teams scored three touchdowns in the first quarter, with both teams disdaining the extra-point kick in favor of the two-point conversion run or pass option. Washington’s Gio Thomas hit Omar Porter for a 28-yard touchdown less than one minute into the game. Thomas hit Dillon Steward with the conversion pass for a quick 8-0 lead. Hillsboro responded quickly with a 24-yard run by Josh Keets. Keets ran in the conversion to tie the game at the 10:39 mark of the first quarter. Next for the Blue Lions, Jameson McCane carried for 21 yards for the score. The two-point pass was no good, giving Washington a 14-8 lead with 6:51 to play in the initial period. Mark Gallimore ran for a 40-yard touchdown for the Indians at the 6:41 mark. Quarterback Mason Swayne hit Reece Bloomfield for the conversion and a 16-14 Hillsboro lead. Thomas then connected with Steward for a touchdown pass play of 53 yards for the Blue Lions. The conversion pass was no good. Washington led 20-16 with 5:24 remaining in the first quarter. Then it was Swayne who broke free and rushed for 45 yards and the go-ahead score. The conversion pass play was unsuccessful, leaving Hillsboro with a 22-20 lead at the 3:29 mark. The second quarter proved to be the turning point as Hillsboro began to get some stops on defense, while scoring four more touchdowns to one for Washington. To start it off, with 10:36 to play until the half, Keets had a 10-yard scoring run. Swayne passed to Deon Burns for the extra two points and a 30-20 lead. Washington responded with Steward running for 30 yards and a score. Thomas hit Steward for the two-point pass to pull the Blue Lions to within two points at 30-28 with 8:25 to go in the first half. The next three touchdowns came from the Indians. First, Swayne had a 1-yard run at the 7:12 mark. Then, with 4:22 remaining in the half, Gallimore broke a 77-yard scoring run. Keets ended the first half scoring with a 9-yard run with 2:17 to play until intermission. Hillsboro converted two of the three two-point after touchdown attempts: one from Swayne to Burns and the other a run by Keets to lead 52-28 at the half. Both teams scored once in the third quarter. For Hillsboro, it was a run by Keets for 45 yards. The Indians’ run for two was no good. For the Blue Lions, Thomas rushed for a 1-yard score. Steward passed to Jalen Pettiford for the conversion. Thomas completed a pass to Steward for a 61-yard touchdown. Thomas passed to Eli Lynch for two points to make it 58-44, Indians. Burns scored the final two touchdowns for Hillsboro on runs of 25 and 4 yards. The Indians missed a two-point conversion and Keets made one extra-point kick. Thomas connected a final time with Steward for an 8-yard scoring play. The conversion pass failed. Hillsboro had 612 yards of offense, all on the ground on 59 carries. Gallimore had 12 carries for 215 yards rushing; Burns had 21 carries for 178 yards and Keets carried 14 times for 174 yards. Jameson McCane led the Blue Lions with 55 yards rushing on 10 attempts. Dillon Steward caught 12 passes for 266 yards to lead the Blue Lions. Washington had 522 yards of offense, with 145 rushing on 34 carries and 377 yards passing on 19 of 35 from Thomas. The Blue Lions are back at home next week to take on the McClain Tigers. Hillsboro travels to Jackson next week. In other FAC games Friday night, McClain lost to Chillicothe Friday, 63-7 and Jackson defeated Miami Trace, 69-0.